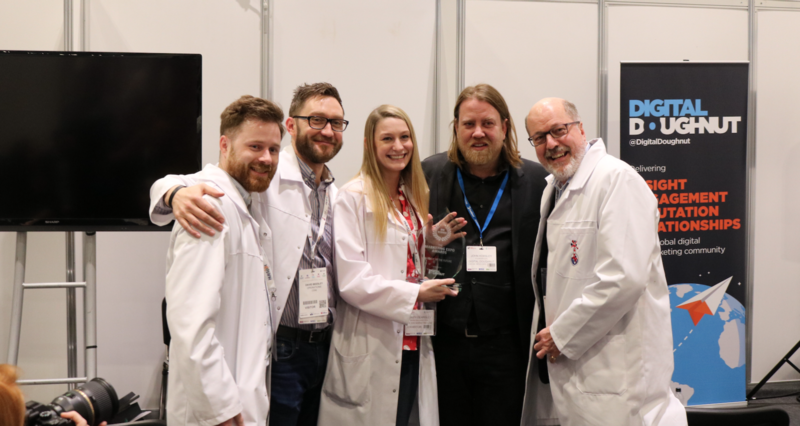 At this year’s B2B Marketing Expo – the UK’s leading marketing event for B2B businesses and the biggest marketing event in Europe – The B2B Marketing Lab was voted ‘Agency of the Future’ by a panel of industry experts, thought-leaders and influencers, winning one of four accolades up for grabs. The ‘Agency of the Future’ award recognises the ‘fundamental role that agencies play in the way digital technology is changing the marketing landscape’ and finalists were chosen based on ‘demonstrating a future-proof strategy for their clients; delivering proven creativity and innovation to generate success’. We would like to thank the B2B Marketing Expo, Digital Doughnut and the panel of judges for choosing us – and we are proud to be recognised for our ability to deliver results-driven, innovative, creative and future-proof campaigns for our clients through the use of HubSpot and Inbound Marketing. “The B2B Marketing Lab winning the ‘Agency of the Future’ award is further recognition of our ability to drive client success through the use of creative, results-driven and future-proof Inbound Marketing campaigns. We appreciate that the relationship between businesses and prospects has changed and in order to attract, convert and close prospects, businesses need an ever-changing, prospect-orientated marketing strategy.” says Verity Dearsley, Managing Director of The B2B Marketing Lab. The B2B Marketing Lab’s Chief Executive, Bob Dearsley, had this to say on winning the award: “As a growth consultancy, our main objective is to help our clients sell more and grow to achieve business success. That means lead generation, customer acquisition and client engagement. Our growth-driven programmes put Inbound Marketing at the centre of the business' lead generation activity. Over the two jam-packed days, we delivered 10 presentations on HubSpot and Inbound Marketing, explaining how they can help you to improve lead generation, customer acquisition, and client engagement. Twenty Questions: Am I ready for Inbound Marketing? Goldilocks and the Marketing Automation platforms: HubSpot, Marketo or Pardot – What should I choose? HubSpot Onboarding - 10 key tips and hacks that you need to know. Get a super effective new website in 13 weeks and lease it over 12 months! We would like to take this opportunity to thank all of those who came down to see us and spend time with us at this year’s B2B Marketing Expo. It was a fantastic experience and we loved nothing more than sharing it with you all. We hope to attend next year and deliver more Inbound Marketing and HubSpot knowledge. If you require support with Inbound Marketing or HubSpot or lead generation, customer acquisition and client engagement, please get in touch and we will see how we can help.